Make a file smaller with super fast speed and no quality loss on Windows/Mac. 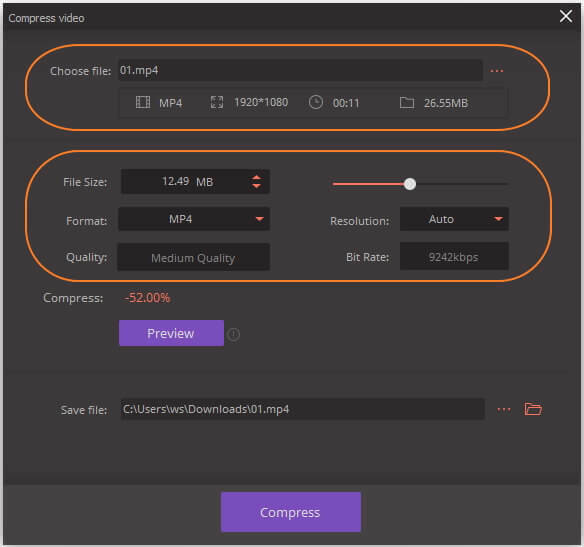 Compress video/audio files by changing bit rate, resolution, encoder, format, and others. How does compressing a file make a file smaller? Many people are seeking solutions for this question on Quora. 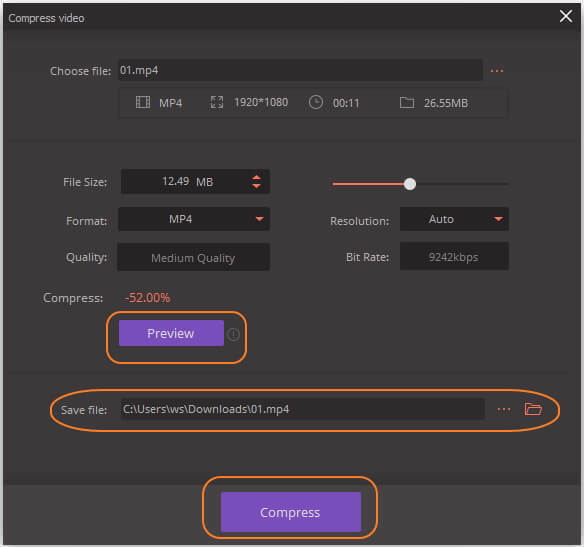 You may learn how to compress .doc, or .pdf as a ZIP/RAR file, however, it's not easy to compress a video or audio file size as the video/audio quality is so important. So you'd better use some professional compressors to help you decrease file size without losing quality. For both Windows and Mac system, easy and free ways are introduced here. You'll find details on how to make a file smaller with the best video compressor, online size reducer, Windows Movie Maker, and iMovie by reading the following parts. Among the long list of programs available to reduce the video file size, the most recommended name is Wondershare UniConverter (originally Wondershare Video Converter Ultimate). 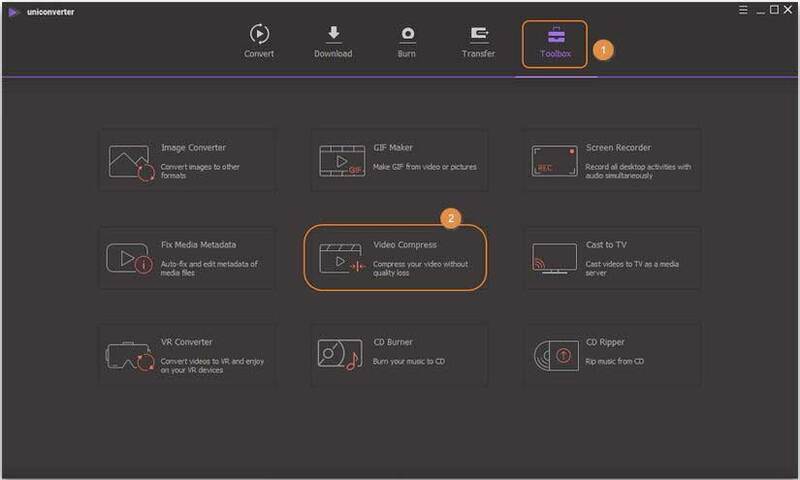 Using this professional video-toolbox, you can compress your video file size by changing its quality, resolution, bit rate, frame rate, and other parameters. All types of video files including MOV, MP4, AVI, and others are supported by the tool for size reducing and other functions. Using Wondershare video file smaller tool, you can choose the compression percentage to reduce the video file size in a quick manner and without any loss of quality. A preview function is also available that helps to preview the file before the process. Compress video and audio files without losing any quality on Windows/Mac. Make a file smaller by changing video resolution, bit rate, quality, size, and other parameters. Support 1,000+ video/audio formats including MP4, AVI, MOV, WMV, MPEG, MP3, WAV, etc. You need to download and install Wondershare UniConverter (originally Wondershare Video Converter Ultimate) on your PC/Mac first. 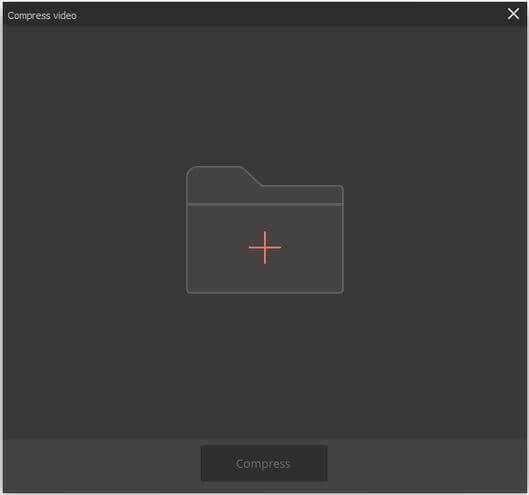 Then launch it and switch to Toolbox section from the main interface, click on the Video Compress option to continue. A new pop-up window will appear, and hit the + sign to browse and choose a video that you want to reduce the size for. One file at a time can be added here. After the video file is added, you can reduce its size by manually changing the parameters like format, resolution, quality, and bit rate. Alternatively, you can also move the progress bar to change the compression percentage that will also automatically change the file parameters to reduce the size. After all settings are done, click on the Preview button to check what the video will be like. 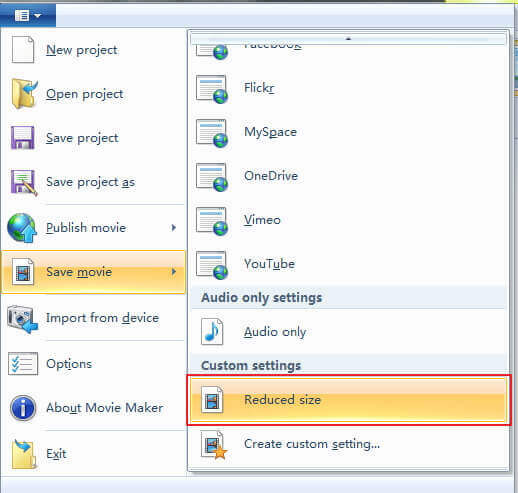 At the Save file: tab, choose the file location to save the reduced video. Finally, click on the Compress button to reduce the video file size as needed. If you want to compress audio files or looking for batch video/audio compression, just move to How to Compress Video/Audio Files in Batch with Wondershare UniConverter >> to learn more details. 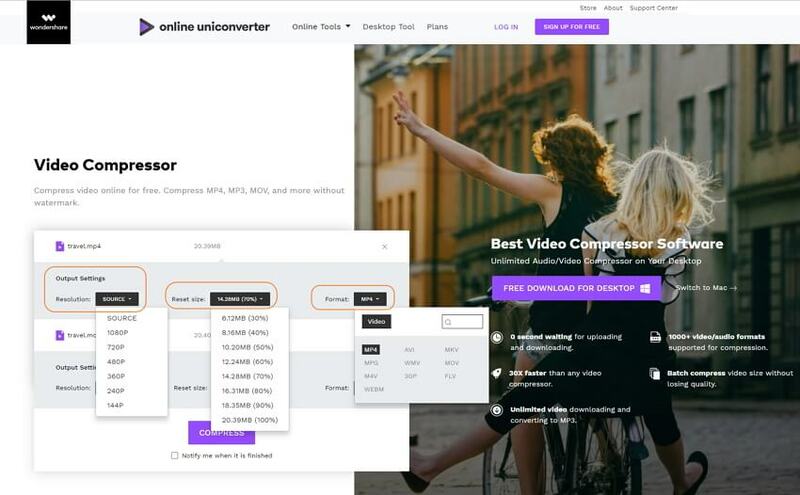 Another decent, fast and simple method for reducing video size is using an online tool like Online UniConverter (originally Media.io). It works from the browser window of your Mac or Windows PC without any need for software installation or registration. In a few simple steps, Online UniConverter can reduce the size of the video added to the program in good quality. Additionally, video format if needed can also be changed. Video resolution and output size can be changed in order to reduce its size. The processed video can be downloaded from the interface to your computer or be saved at Dropbox. 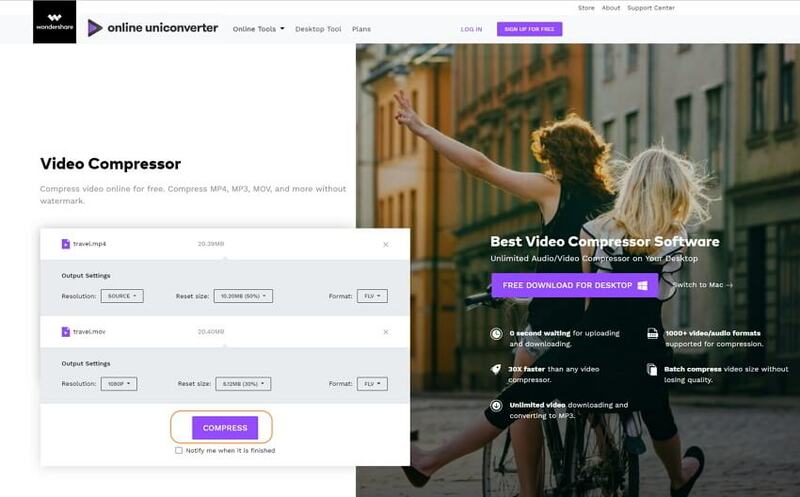 Step 1: Open https://www.media.io/video-compressor.html on your browser window. Click on the + sign to browse and add video from the computer. You can even drag and drop the video to the interface directly. Step 2: Change the video resolution and the output size as needed. There is also an option to choose the output format from the given options. Step 3: Click on the Compress button to make a video file smaller online. You can download the compressed video soon after the process finished. 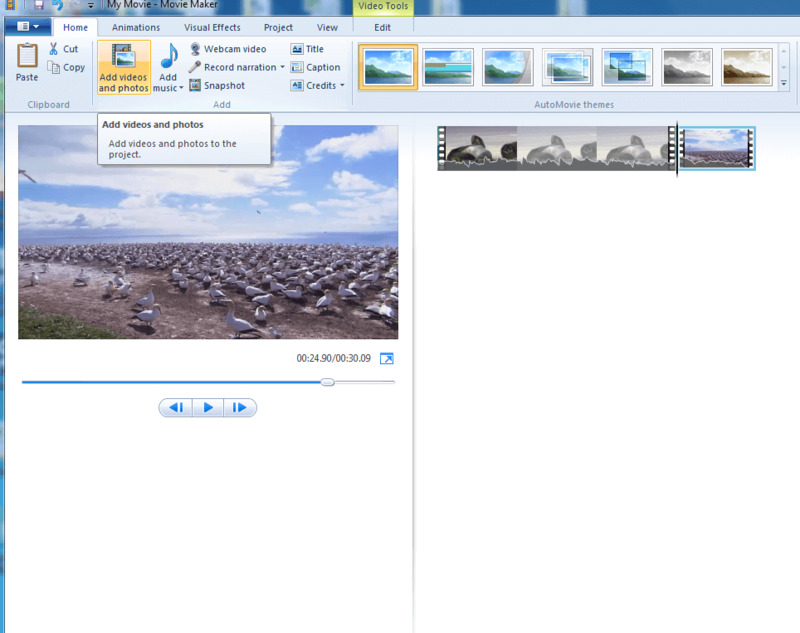 Developed by Microsoft, Windows Movie Maker is a video editing tool that supports an array of functions including video compression. Using the program you can reduce the size of the added video in a simple and quick manner. Using the software you can change the bit rate, frame rate, and other parameters of the video so as to reduce its size. While working with Windows Movie Maker, you need to consider the format as all types of format is not supported by the program. For unsupported formats, you can change them to the supported one and then reduce the size as needed. 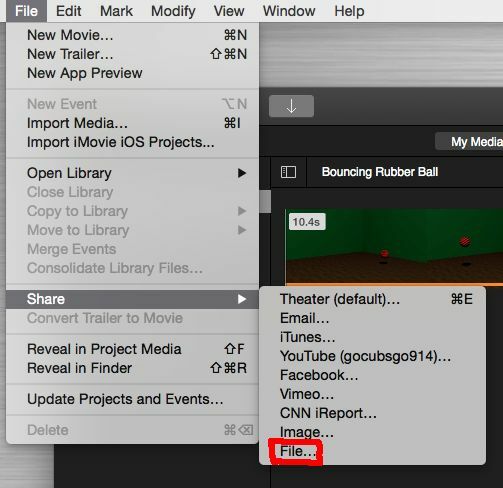 Step 2: The program allows customizing and editing videos through features like trimming, splitting, adding transitions and others. 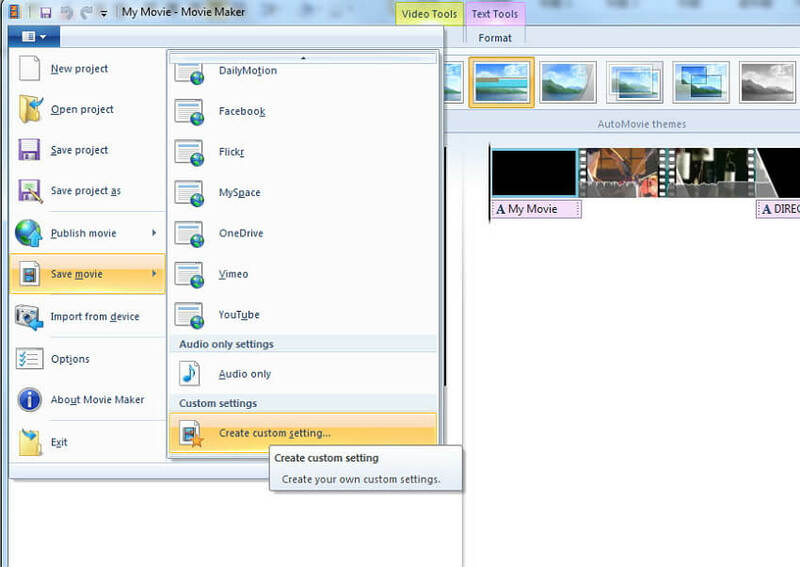 Step 3: After video editing is done, open File > Save Movie File > Create custom setting. A new pop-up window will open where you can edit the video and audio settings with respect to width, height, bit rate, and frame rate. Under the Settings tab, you can choose from the given options to change the size of the video. Also given a new name for the settings done under the Name tab. Click on the Save button to confirm the settings. Step 4: Finally move to Save Movie option again and then hit on the file under the Custom Settings. Click on the customized settings name to start the process of video compression. Developed by Apple, Inc iMovie is video editing software with support to a variety of functions. The program works as an excellent video compression tool for Mac system and results in quality files in a quick and simple manner. The file size of the video can be reduced by changing its quality, bit rate, resolution, and other parameters as desired. 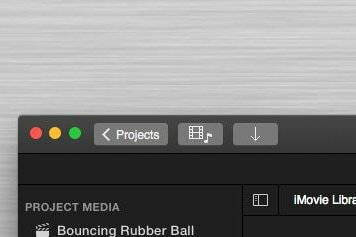 Step 1: Launch iMovie app on your Mac system and click on the downward facing arrow or Import Media button to browse and add the vidFeo that you want to reduce in size. Step 2: After the video is added, select File > Share > File from the Menu bar. Next, choose the settings for quality and resolution so as to reduce the file size. Click on the Next button and then give a desired name to the file. Also, choose the location on Mac where you want to save the reduced file. Step 3: Finally, click on the Save button to start the process. Looking for best solutions on how do I make a file smaller? Check out the above-mentioned methods and depending on your system and requirements, choose the apt one for hassle-free, lossless quality file compression.